Pre-Owned | Hard Bound with Dust Cover | 442 pp | Dimensions: 8.1" x 5.5" x 1.6"
ISBN# 978-1-56731-830-2 | Fourth Edition | 1999 Haworth Press Inc. This reference book is in good condition with no markings and only minor shelf wear. The dust cover is in good shape without any tears. 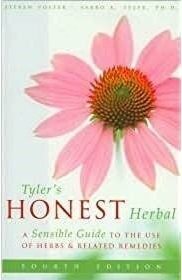 Even though Tyler's Honest Herbal has been through several editions over the years, with updates on medicinal discoveries through individual case reports, the best part about this book is reading what the author has to say about 130 different plants from Alfalfa to Yucca.